The Chevrolet Chevy II Nova was a rush job. In a March 1962 issue of Popular Mechanics “Owners Report”, it was clear that the three greatest dislikes by owners were high fuel consumption (18.3 mpg overall average), shoddy paint jobs and lax quality control. Previously, GM had pinned all of their “all new compact car” hopes on the highly ambitious and very technically advanced (for the day) rear engine, air-cooled Corvair that was introduced for 1960 – and promptly saw Ford eat their lunch. The 1960 Ford Falcon outsold the Chevy Corvair by 185,669 pieces in 1960, a result totally unacceptable to GM. Of course, GM couldn’t admit their error, and being the largest auto manufacturer in the world, could afford to have two Chevrolet compacts competing against one another in the showrooms. The saving grace for Chevy was the fact that the old “stovebolt” six for full sized cars was finally being replaced after a run of over three decades in production. Otherwise, the company would have had to adopt a smaller inline six from an offshore foreign subsidiary such as Holden, Opel or Vauxhall in order to introduce a car as quickly as they did. In the end, a smaller bore, reduced displacement inline six was easily and quickly developed from the new planned big six, and two cylinders lopped off for a new inline four intended only for the Chevy II. 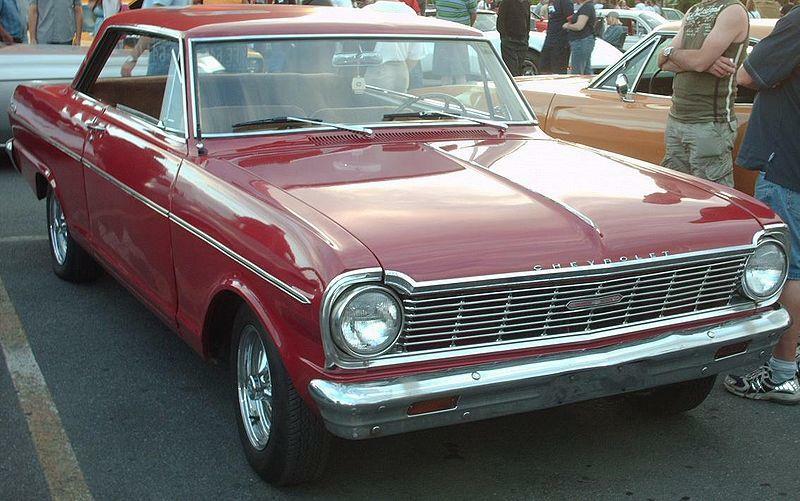 The car was introduced as the Chevy II, with Nova being an upgrade trim. The car was utterly conventional, though flawed from the start having been saddled with an extremely long inline six originally intended for full sized cars. Combined sales of the Corvair and Chevy II/Nova started to encroach on Ford’s successes, and by 1964, Chevy II/Nova could even be had with the small-block 283 cube Chevrolet V-8, to compete with the Falcon V8 introduced a year earlier. An SS option could be had from 1964, not coincidentally with the introduction of the V-8, though SSs could be ordered with sixes, too. Even a convertible was introduced from 1963, and these are probably the more collectible versions car, especially in SS V-8 form from 1964 through 1967. A light facelift and reskin came along in 1966, giving the car a clean appearance very similar to the larger Chevelle and Malibu.